We’re very excited to announce the launch of our first ever pop-up Shoppe. 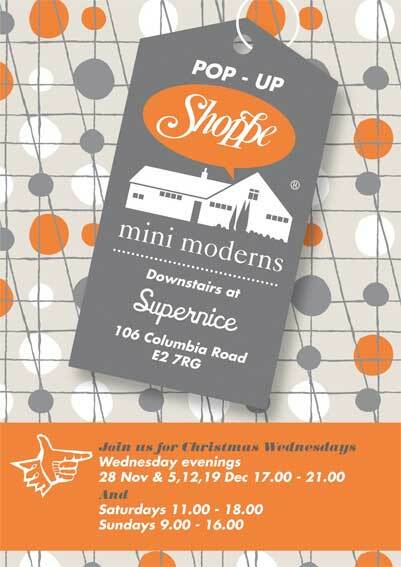 From Wednesday 28th November, Mini Moderns will be bringing pattern and colour deliciouness to the space downstairs at Supernice, 106 Columbia Road. We’ll be featuring our entire collection, plus a few exclusive limited edition Shoppe only products. Come see us for our launch event on Wednesday 28th from 5pm, or on any of the following three Columbia Road Christmas Wednesdays – or come on a Saturday or Sunday.